Pop your pills – just don’t pop this pills button! Another advertisement button – this medicine button is crisp and clean, much like the clinical setting. 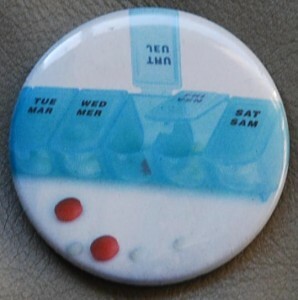 Do make a drugs button with your button maker! This entry was posted in Badge-A-Minit and tagged Badge-A-Minit, badge-a-minute, BadgeAminit, Badgeaminute, drugs on August 29, 2013 by Barry Badge. 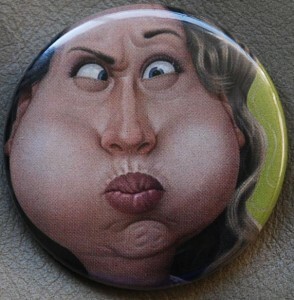 Big cheek face button, taken from an advertisement. 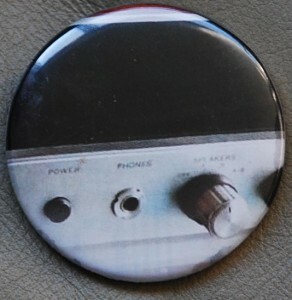 This comic pin-back button is comical! I like how the advertisement button is off-centre. It’s a good example of how you can take almost anything and make a pinback button out of it. This entry was posted in Badge-A-Minit and tagged Badge-A-Minit, badge-a-minute, BadgeAminit, Badgeaminute, face on August 14, 2013 by Barry Badge. This stereo button was taken from an ad, like the last entry. The person took a larger image and made a radio button. Have you made any music buttons from images in magazines? Send them to us, and we can show them on here! This entry was posted in Badge-A-Minit and tagged Badge-A-Minit, badge-a-minute, BadgeAminit, Badgeaminute, music on August 7, 2013 by Barry Badge.